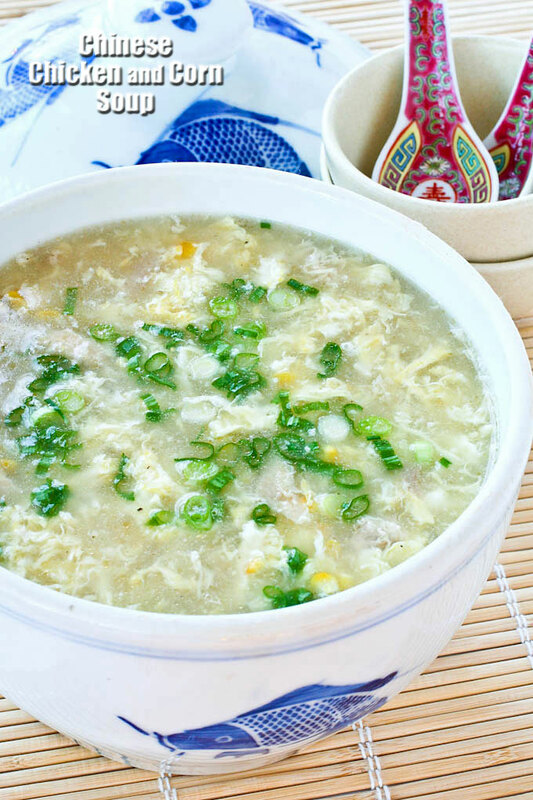 Shredded chicken meat, crunchy corn kernels, and chicken broth make up this easy Chinese Chicken and Corn Soup. A must try when fresh corn is in season. Soups have always been an important part of the Chinese food culture. They are considered as one of the most nutritious foods and are prepared on a daily basis as part of the meal. For many families, a meal is not complete without a soup. 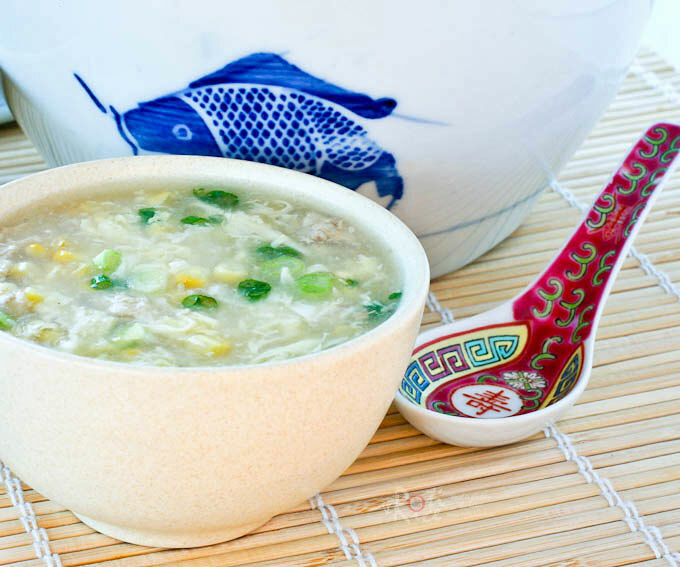 In fact, the Cantonese people often ask their loved ones if they have taken soup as a greeting. Soup is taken throughout the meal together with rice and the other dishes and it is often used to soften the rice for little children. Chinese soups are generally thin and clear broths. These clear broths are further categorized into quick-boiled or slow-cooked soups. Quick-boil soups are enjoyed for their refreshing and cleansing properties while slow-cooked soups using meats and herbs are treasured for their highly nutritious properties. Thick soups are usually thicken at the end of the cooking process with starches or egg. Milk is rarely if ever used. This month’s theme for World on a Plate is SOUP. 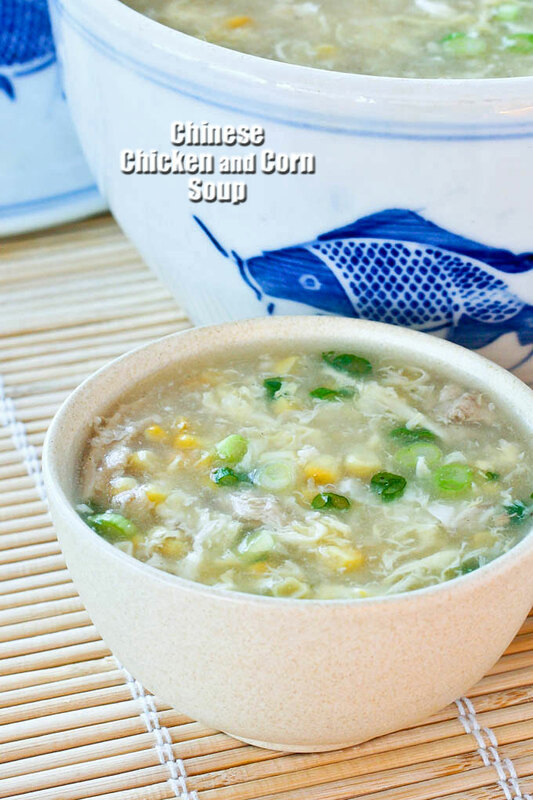 With the last of summer corn, I decided to make this quick and easy Chinese Chicken and Corn Soup. Fresh corn gives the soup a crunchier texture and clearer appearance. Canned cream corn may be used for a smoother and creamier texture. It will also give the soup a more golden color. Please do click on the linky below to see what the others in the group have prepared. Place chicken broth in a large pot and bring it to a boil. Add shredded chicken meat and cooked corn kernels. Allow it to come back to a boil. Lower heat and let it simmer for 5 minutes. Add cooking wine, salt, and pepper to taste. Combine cornstarch with 3 tablespoon water. Pour into soup, stirring to thicken. Lower heat and slowly pour beaten egg through fork tines. Gently stir and immediately turn off heat. Drizzle sesame oil into soup. Serve in small bowls garnish with sliced green onions. That looks good! I remember in Hong Kong there would always be soup at the beginning of a meal and I loved it! I wish I knew how to cook them! Oh wow that looks so good and comforting. Looks really simple to make too. Nice recipe. Thanks Raymund! Yes, the soup has a nice silky texture that is very pleasing. I love chinese soups and I always order when I go to a chinese restaurant.I would love to have bowl of this one waiting for me when I get back from work! Thanks Katerina! Good idea to order soups, especially the slow-cooked ones at the restaurants. They can be very delicious and rounds off the meal nicely. This looks warming and tasty. Perfect for the rainy days we have here. Thanks Angie! I love soups any day as they are so warming and comforting. Thanks Ramona! Glad you enjoy the soup. This soup looks SO good! I also believe in the healing properties of soup. Must try this some time! Cold or no cold, I’m going to be making this soup! My mamma always made chicken soup when I was sick also so this soup really hits home. I love the addition of the egg and the sesame oil being added at the end! Great soup! BTW – I sent you an email to your gmail account. Did you get it? If you don’t see it, please check your spam. For some reason, some of my gmails are getting spammed. Thanks! Yum, yum, I love this soup and can have 2 servings at one sitting! 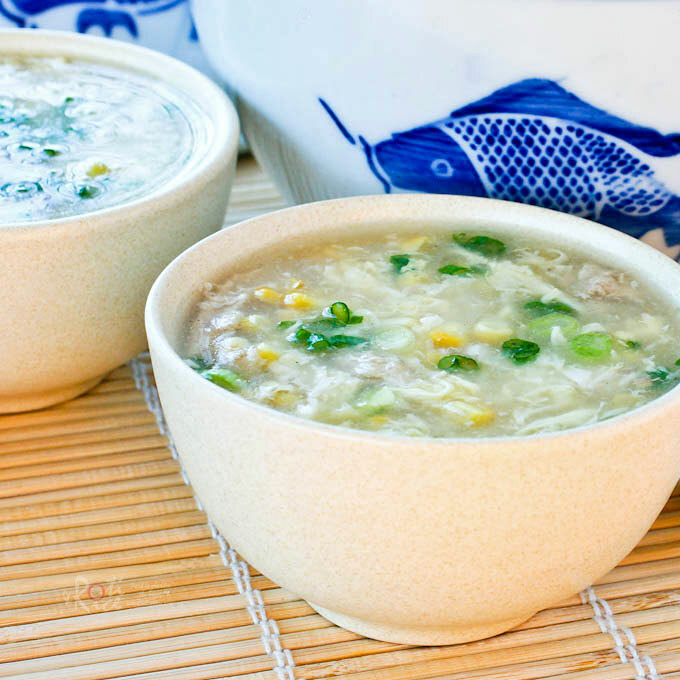 Eggs together with corn starch are often used as thickeners in Chinese soups. I like them all. Cream soups are delicious too and my youngest son love them. I love making soup! Particularly at this time of the year – when it’s chilly, nothing is better than a warming bowl of hot soup. And corn always works so well in soup. Love the flavors – this is a meal all by itself! You are so right about this being a meal in itself. I had two servings and I was full and satisfied. I LOVE soup and can have it every single day without feeling bored or jelak! Sad thing is I’m the only one at home who loves it. Everyone else hates it 🙁 So I hardly bother to make some just for myself. Once in a while I will make a slow simmered herbal soup (my favourite) for the whole family and just ignore the frowns and complaints 😉 Your corn soup looks lovely – I think the few times I had this soup with crab meat instead of chicken, it was at Chinese weddings, when sharks fin soup was not on the menu. I have a can of creamed corn in the cupboard and really feel like having soup for dinner tonight…. I LOVE soup too and mom made it almost everyday. Good thing my family likes it too as it is so warming during the colder months. Crab would make this very tasty but I did not have any on hand and did not want to drive to the store. Still it was pretty tasty. Herbal soups are also fantastic in the cold weather. I need some dong gui soup real soon. I’ve got to make this Biren! Yum! So easy too! Do give it a try, Cynthia. Thanks for visiting! I live on my own so always like to freeze my excess soup, should I leave the eggs out before freezing, will they go rubbery. Can’t wait to try it looks yummy. Yes, you can leave the egg out until you reheat the soup.